We live in a Wilsonian America. We began with a Madisonian America. Against the backdrop of World War I, John Henry’s Republic Undone dramatizes the conflict over the meaning of the American Revolution -- what it means to be an American. The play features the galaxy of personalities that sashayed across the stage as Woodrow Wilson ascended to power and orchestrated America’s entry into the Great War. His first wife Ellen, Andrew Carnegie, William Jennings Bryan, Alice Paul and Henry Cabot Lodge argue for a Madisonian America that exalts separation of powers and prohibits presidential wars. Colonel House, Mary Peck and his second wife Edith defend a Wilsonian America that salutes limitless executive power to go abroad in search of monsters to destroy. Republic Undone explores Wilson’s narcissistic personality as he crushes any opposition to his will. The ghost of James Madison attacks Wilson for destroying the Republic that secured peace to enable women and men to march to their own drummer. Wilson dismisses Madison as a museum piece that would hobble Americans from spreading goodness in every corner of the world. 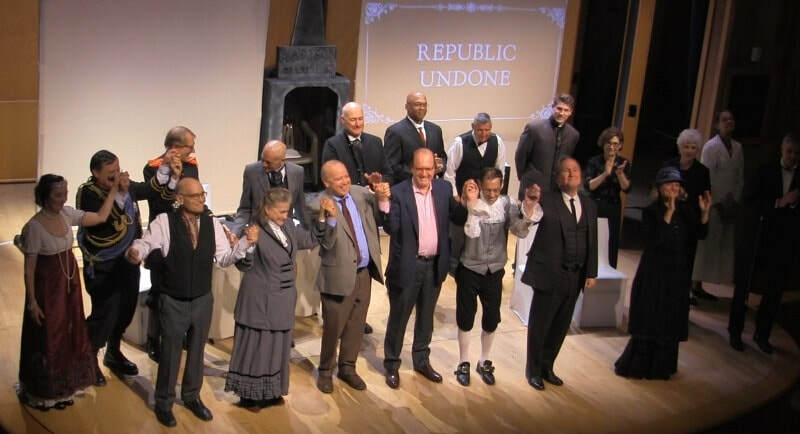 Republic Undone is directed by Rick Davis, Dean of George Mason’s College of Visual and Performing Arts. Stone Hill Amphitheatre is an outdoor venue with parking provided. Camping chairs and/or picnic blankets are recommended. Etlan Little Country Store BBQ will be on hand with food and refreshments for sale. At 7 p.m. Geroge Mason's Green Machine Band will perform a pre-show musical assortment. The play begins at 8 p.m. and runs a little more than an hour. This event was made possible in part by a grant from the RAAC Claudia Mitchell Arts fund. Alternate venue will be annouced 48 hours in advance of predicted bad weather.